Summer relaxation has been a lot of work lately. I have been playing a few video games, true, and reading a lot. But, there’s been some work getting done around here as well. First off, my honey asked me to redo our closet. She had some ClosetMaid stuff from her previous accommodations so we got some other stuff and went to town. First, we pulled out the old closet shelf and bar then patched up the holes. Of course, we had to paint in there, too. Then, up went a new shelf, a new bar, some cubby shelves and her shoe palace. Yes, I said shoe palace. See, we had a china hutch that we got when we purchased our kitchen table. It was from a private party and they were moving so they threw in the china hutch with the table. We didn’t want it and we didn’t have any china to put inside of it, either. So, it sat for a long time until I had the idea to put the lower half of it under our flatscreen in the family room. That worked, but now we had the upper half of a china hutch sitting in our living room. Honey got the idea to turn it into a shoe palace. As much as possible, I like to give honey what she wants. She is my favorite woman in the whole world, after all. So, we managed to get this thing up our stairs and into the room. I cut a thin piece of plywood to fit the top and screwed it down to create a flat top. Then, I stained it. The stain is still drying. 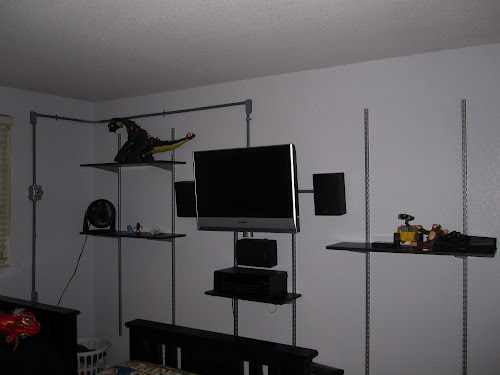 Meanwhile, we went into the boys’ room and redid their closet so they can better share the space. Their TV got mounted on the wall. I pulled in my old home theater sound system and mounted those speakers on the wall as well so they could have 5.1 sound. 🙂 We painted the room a light bluish-gray and began decorating in a “garage/industrial” theme. We used plastic PVC conduit attached to the walls to go around with the speaker wire inside and give it that industrial look. We got a couple of junction and switch boxes to spruce it up a bit, as well. I installed some shelves, too, but the DIY store didn’t have all the shelving supplies in stock so they are unfinished as of yet. After fishing some of the other wires behind the wall, I was finished with that phase. That was several days’ work. So, besides Assassin’s Creed 2, that’s most of what I’ve been up to. We had decided to have our kids start a blog, too, so they can keep their writing skills sharp over the summer. And, as a teacher, I think it’s good to write when your kids do. So, here’s the post I wrote while they did theirs. Now, back to relaxing.